Introduction: Bought a Car Lately? In the 21st century the old negotiation approaches don't work anymore. 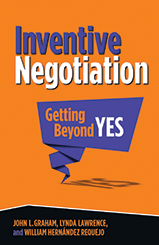 Inventive negotiation is older than history, and more advanced than the future – and it's based on the most basic human talent: imagination. It begins with a glimmer of hope, the vision that things can be better—even world-changing. You have to find just the right partners and sell them on your vision. Then you build relationships—with those on the other side. You create the system that makes these relationships happen. You add exactly the right people in specific situations, including facilitators. You consider culture and encourage diversity. You meet in the right places and the right spaces, at just the right pace. You leverage emotion and overcome power and corruption. You use tools of innovation. And you use the tools of improvisation. You keep improving the relationships in new ways.